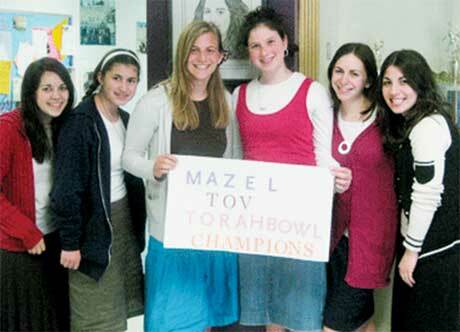 Rachelie Goldschmidt (fourth from left) with members of Bat Torah’s Torah Bowl team. From left are Chevie Pahmer, Leora Zomick, Nicki Kornbluth, Goldschmidt, Daniella Eisenman, and Tzippi Berman. Dara Goldschmidt has fond memories of her days at Bat Torah Academy ““ The Alisa M. Flatow Yeshiva High School. “I had a very positive experience,” said the former Monsey resident, who attended the school – then in Suffern – in the late 1970s. In 2008 the school moved into the old Frisch high school building in Paramus. “It was very traditional and very committed to halacha yet open-minded and Zionist in orientation, always pushing girls to think, to embrace issues, and to become people of the world. It wasn’t a small-minded approach,” said Goldschmidt, who has spent the last 21 years living in the former Soviet Union. Wife of Moscow Chief Rabbi Pinchas Goldschmidt and founder of the Etz Chaim state Jewish school there, the Bat Torah graduate has a new connection with her old school: Her 15-year-old daughter Rachelie took up studies there last year and will soon enter 10th grade. Goldschmidt explained that while her two older daughters, now ages 17 and 19, attended school in Russia, the family decided to send Rachelie to Bat Torah on the urging of school principal Miriam Bak. Even though the parents had originally intended to bring Rachelie back to Moscow, they changed their minds after visiting the school’s new facility. “Jewish education is much more comprehensive here,” said Goldschmidt, explaining that the state school in Moscow – which she founded in 1991 and now serves some 350 students – is limited in terms of how much ethnic and cultural education can be offered. “It’s not an intense Jewish education,” she said. “It’s more identity-based.” Her own children, she said, participated in a supplementary track providing more intensive Jewish training. Goldschmidt did not speak Russian when she first came to the country, “but I was teaching within two years,” she said. The school, which started as a kindergarten and is part of the Lauder network, has grown steadily, she said. The network, established by the Ronald S. Lauder Foundation, embraces several dozen schools in Central and Eastern European countries. Goldschmidt noted that her husband is based at the Moscow Choral Synagogue, “the only one that was opened legally during the communist years.” Some 200 people attend on a typical Shabbat, she said, while more than 1,000 participate in High Holy Day services. Rachelie’s adjustment has not been difficult, said her mother, since the girl’s grandparents live in Monsey and her aunt – Danielle Brodie Bloom, a 1996 graduate of Bat Torah – is a teacher at the school. Goldschmidt said her daughter appears to be thriving in her new school, a view echoed by Bak. Her favorite subjects, she said, are history, Jewish history, and Chumash. Rachelie pointed out that in Moscow she had never learned “Torah she baal pe,” Jewish oral law, which she is learning now. Socially, however, Rachelie was better prepared. The fact that Rachelie’s mother attended the same school has also been a positive, she said. “It feels like I have a much bigger connection with the school than I normally would,” she said, adding that her mother got a lot from the school, as she is doing now.